"Droughts! Floods! Fires!" Headlines shout the news of one natural disaster after another as thousands of lives are lost, buildings and homes are destroyed, and Earth's surface is drastically altered. Experts claim that the number of natural disasters each year is on the rise. According to Reliefweb, a United Nations project, over 70 natural disasters occurred worldwide during 1997. How does that number compare to past years? How does that number compare to data for the current year? 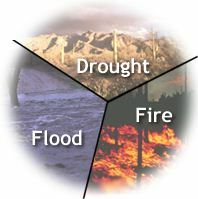 Photos: Courtesy of www.arttoday.com (Drought & Flood) and Dr. David L. Adams, Professor of Forest Resources, University of Idaho, Moscow, Idaho (Fire). an apparent increase of events because as the world's human population grows, more and more people choose or are forced to live in disaster-prone areas. What constitutes a natural disaster? If a hurricane hits a city, we consider it a natural disaster, but is it a disaster if a hurricane hits an uninhabited island?